NYG lacks both quantity and quality at the safety position and I think it’s the weakest position on the team’s depth chart. It’s been a pair that has lacked stability for years when considering both positions. Antrel Rolle fulfilled his FA contract from a few years ago but the team opted to let him walk in free agency which resulted in him signing with Chicago. There were reports that NYG went after Devin McCourty but ultimately failed to entice him to leave New England. The Giants are now left with young and unestablished safeties that even the optimist should be worried about. The scouts were high on Berhe at this time last year, saying he could play the versatile safety role that will bring him in the box to defend the run as well as match up with receivers in man coverage. Taylor hasn’t been healthy and he has the look of a special teamer, not a starting defender. Gordon and Gordy are training camp bodies at best. If NYG does make another move in the FA period, expect it to be safety. Stevie Brown is still out there. Strong Points: Versatile back end defender. Instinctual mover, consistently in the right position pre and post snap. Anticipates the action and reacts fast. Explosive downhill tackler that closes a 10 yard gap as fast as anyone. Has a strong power presence, built thick and plays thick. Sound tackler in space, will wrap up and hit with force. Soft hands, good ball skills. Shows the coordination and timing to get his hands on the ball while on the move. Explosive blitzer off the edge, times it well and can find his way through traffic. Has strong steps, a lot of balance and body control. Consistently shows the ability to recover and catch the man he his chasing in coverage. Rangy run defender that can reach either sideline with ease. Weak Points: Seems a step behind as a coverage safety. Struggles to play the centerfielder role, may not have the deep range to play a deep half. Moves heavy in man coverage. Shows stiffness and may play too bulky. Inconsistent footwork and mechanics, depends on his athleticism too much. Summary: Junior entry Defensive back that has played a few roles at Alabama, including free and strong safety, cornerback, and gunner on special teams. At his best when moving near the line of scrimmage and defending the run and underneath passing game. He is a reliable tackler in traffic and in the open field, and has shown the ability to anticipate throwing lanes and routes as a pass defender. He played the 2014 season at over 220 pounds and it may have slowed him down a bit and made him a heavy read and react cover man. He may need to quicken his reaction and hips if he wants to meet his sky high potential. *There has been a healthy debate going back and forth regarding just how good the best safety in this class really is. Is he overrated as a result of such a poor overall group? Or is Collins a legit 1st round prospect that could be considered in the top 10? I think Collins is closer to a top 10 guy than he is a 2nd rounder, I’ll say that much. He is versatile to play any role you want a safety to fulfill. He is probably the best tackler among all the DBs and he’s shown he can run with the speed of the SEC. Collins lacks superstar production and superstar athletic ability, thus there are several people that rightfully downgrade him to an average prospect. I think Collins is a player. He does all the little things and he has shown on multiple occasions that he does have the upper tier coverage ability and ball skills. Day 1 starter that could be considered at #9 overall. Strong Points: Versatile tools and skills for a defensive back with experience at safety and cornerback. Physical approach with consistent aggression, always competing. Anticipates and reacts well. Will reach his top speed with acceleration and explosion. Has long strides in space, can run with speed downfield. Will make quick adjustments. Can locate the ball and adjust his bodyweight. Good body control. Will make the tough tackle in space, uses his length and physical nature, wraps up well. Disciplined and smart. Weak Points: Better off in zone coverage. Doesn’t have the effectiveness as a man defender as he does in zone. Struggles to make the quick 180 degree turns. Hips can lock up on him from time to time. Won’t deliver a violent blow as a tackler. Questionable lateral range in deep coverage. Summary: Fourth year senior that started 45 games over his career. Played safety for three seasons and moved to cornerback in 2014. Rowe will be viewed as a cornerback for some teams and safety for others. His tool set can be used in both roles effectively. He has great triangle numbers (height/weight/speed) in addition to a developed skill set for either position. He is physical, quick-twitched, and smart. Rowe showed the ability to make plays on the ball and will consistently compete. For teams that want a cover-based safety, Rowe could be a high pick. He also brings Tampa-2 cornerback ability and showed production on special teams. *Depending on who you ask and what defensive scheme you run, Rowe can be viewed as a CB or a S. I think with NYG he could play both but there is a brighter future and greater need at S. Rowe is physical enough to handle the enforcer/run support roles but to have a guy with this kind of speed and fluidity in his hips playing behind the defense would be a welcomed addition in round 2. Rowe is one of my favorite day 2 prospects for NYG. Strong Points: Quick and light feet with easy, smooth hips. Great body control, rarely looks off balance. Anticipates and reacts well. Has the suddenness in coverage to easily change direction. Explosive out of his breaks, can close a short gap in a blink. Reliable hands in traffic. Can adjust his body on the move and bring the ball in like a receiver. Understands angles and is aware of his speed in relation to his positioning on the field. Good range in deep coverage. Outperforms his speed because of his agile lower half and ability to diagnose and react. Makes the effort as a tackler, will wrap up and stick to the ball carriers. Reliable as a tackler in space. Confident and aggressive. Weak Points: Lean frame that plays weak when it comes to presence as a tackler. Won’t deliver a big blow to the ball carrier. Won’t factor as physical defender within the box. Lacks the top end speed in deep space. Will struggle to recover and chase from behind. Summary: Junior entry and three year starter. Hackett leaves TCU with 12 career interceptions and among the team’s leader in tackles over the past three years. He is a space-friendly athlete with such an easy moving lower half and great body control. He has proven to be a playmaker, showing the ability to create turnovers in coverage and as a tackler. He is a quick thinking, savvy defender. He lacks the physical presence as a tackler, thus may not be anything more than a deep coverage defensive back. The coverage ability and versatility in zone and man roles are always in demand, however. Hackett has starter potential if he can prove he has enough speed. *The combine workouts were rough for Hackett but it hasn’t deterred my view of him. I went back and watched a few of his games again and I kept seeing what I initially liked, a cover-first safety that was quick to anticipate and react with easy movement and smooth ball skills. He is athletic enough to play single high if need be. He won’t add a physical presence back there but as a 3rd round target, NYG could do a lot worse. Strong Points: Versatile defensive back with game experience at cornerback and safety. Explosive athlete. Can pursue across the field and make tackles on the move. Will close in on a ball carrier in a blink. Anticipates routes and throwing lanes. Competitive in coverage. Will get his hand on the ball in most one on one situations. Savvy defender when making his way through traffic towards the action. Shows toughness in a crowd. Playmaker type with the ball in his hands. Weak Points: Inconsistent toughness and tackling. Too often he dives after the ankles of ball carriers when they have a head of team. Whiffs in space too much. May not have the size necessary to play an in-the-box safety role. Physical reactions to double routes aren’t fast enough. Takes too long to change direction in deep coverage. Too many recovery steps needed. Quick twitch doesn’t match his explosion and speed. Summary: Fifth year senior. Played baseball at Butler Community College before playing beginning his All American football career as a cornerback and return specialist at Mesa Community College. Started for the Sun Devils for two seasons at safety. Randall has upper tier explosion and top end speed. He has the makings of a playmaker that can change games. However his skill set needs a lot of work and may be a guy that needs a very specific defensive back role in a very specific scheme. He isn’t a physical presence across the middle or in the box, and he struggles to react to double moves and quick twitch receivers. He could be a package player down the road, but his future may be best suited on special teams as a gunner. *There are some people I respect with a top 45 overall grade on Randall. I’m not there but I have upgraded him since my initial view. He can move really well and there are coverage abilities that most safeties on this list do not have. He could be a versatile defensive back in the NFL that can line up over the slot on one play and play a single high role on the next. He won’t add anything as a run defender or enforcer, but he can be productive player in the right scheme. Weak Points: His movement in short space doesn’t match the speed he has in a straight line. Takes too many recovery steps. Won’t read the routes coming at him and is often less guessing. Struggles to stick with receivers on routes other than something deep. Takes too long to react to underneath action. Struggles to burst from a stand still, lacks the explosive element to his game. Summary: Fourth year senior. Was a 1st Team All American in 2013. Has been starting since the end of his freshman season and hasn’t missed a game since. Prewitt is a unique player with a versatile tool set. He has the size and presence of a tackler, but has proven to be a factor in deep coverage. His best fit is strong safety in the NFL because he is at his best when he is attacking the action in front of him. He can be a force within a specific role, but he has shown weaknesses in coverage that teams will look to exploit if he is given too much responsibility. *I had Prewitt graded at 77/78 for awhile and he was a day 2 target for NYG in my book. Recently was informed of some work ethic/approach issues that made me downgrade him quite a bit. I just don’t like hearing certain things and Prewitt’s talent will only take him so far. With that aside, I think he can still be a 3rd rounder. He has size and presence, almost appearing to be an extra linebacker at times. He is a long strider that may be a liability in coverage against quicker wide receivers, but he has some deep range to him when he starts high. I think he is a guy that NYG will like if the off the field stuff doesn’t deter them. Strong Points: Versatile tools and skills. Has the movement ability to stick to receivers all over the route tree. Can change direction with precision and body control. Can turn his hips and run vertical with the speed receivers. Closes a gap ion front of him fast. Will make quick decisions, rarely caught out of position. Reliable tackler when he is in position, can get his hands on the ball carrier and stick to him. Weak Points: Lacks a physical presence in the box. Won’t stifle blockers and doesn’t deliver much of a pop when tackling. Takes bad angles in pursuit towards the sidelines. Will lose track of cutback responsibilities. Gets caught looking in to the backfield, loses track of the action around him in coverage. Summary: Fourth year senior. Amos has plenty of starting experience at both cornerback and safety. His ability to stick with receivers up, down, and across the field will be sought after by every team. His presence against the run is sub-par, however. He doesn’t tackle well and his angles in pursuit need work. His best role in the NFL will be within pass defense packages where his ability in both man and zone schemes can be used. Strong Points: Enforcer over the middle that takes pride in making others players scared. Plays with an aggressive, downhill, heat seeking missile approach. Hard hitter that tackles with good form. Has the feet and awareness to stick with tight ends and some receivers in man coverage. Diagnoses and anticipates the action well. Will mentally react, makes the right decision and can put himself in to position. Has the speed to recover from mistakes, can make up ground. Weak Points: Stop and go quickness when moving laterally or backwards in coverage does not match his downhill athleticism. Might be limited what you can do with him in deep coverage. Bit of a roamer that is constantly looking to make the big hit. Plays a dangerous game, will launch himself through the ball carrier too often. Doesn’t show quick twitch in zone coverage. Summary: Fifth year senior and four year starter. Finished third in school history with 383 career tackles. Was second on the team in tackles four straight years. Geathers is one of the most aggressive defenders in this class. He relishes the role of enforcer and takes a lot of pride in altering the intentions of players that cross the middle of the field. His downhill explosion and consistent ability to finish off plays will be sought after by teams looking to improve their physical presence on defense. Geathers is an intimidator but lacks fluid movement in coverage, thus his role may be limited at the next level. Most teams have a role for this kind of prospect, however. In a weak safety class, this is a guy that could hear his name called earlier than expected. *If NYG is looking for a safety that will bring a power presence to their secondary, Geathers is the guy. I’ve wanted the front office to add more physical players to their defense for years now and it is still lacking. Geathers can scare receivers. He can finish off running backs. He is a powerful, big safety with more than enough speed and explosion. He may have the highest upside among all the safeties in this class, he’ll just need to clean up his coverage mechanics. Strong Points: Easy mover with excellent body control and balance. Light feet and fluid hips. Can turn his body and accelerate fast. Seamless transitions. Aggressive pursuit of the ball carrier. Shows the sideline to sideline range as a run defender. Effective tackler, wraps and drags to the ground. Fast physical reaction. Can explode downhill and close a gap. Reacts to the ball in the air well. Shows the ball skills necessary to make plays on the ball. Can adjust his body on the move and get his hands in the way. Can stick with receivers in man coverage. Has the recovery time and speed to make up for poor reads. Can run deep with receivers. Weak Points: Lacks the awareness of the action around him. Shows the tendency to look in to the backfield without keeping his head on a swivel. Often playing catch up coverage. Lacks a presence as a tackler and enforcer. Doesn’t deliver the violent jolt to ball carrier. Can be overpowered by blockers and ridden out of the play. Looks frail at times. Summary: Harris has never missed a game over his four year career, including the past three as a starter. Has been very productive with 10 interceptions and 16 pass break ups over the past two seasons. Harris is a very good athlete that moves well all over the field. He has the body control and ball skills to make a difference in coverage. He just needs to become a smarter and more aware player in coverage. He doesn’t have the frame to enforce the physical brand of football, but he is an aggressive player that will put his body on the line. Starter potential that can impact the run and pass defense. *Hard to figure this guy out. Harris was the epitome of dependability and durability during his accomplished 4 year career. He’s been fighting a lingering shoulder issue throughout the pre-draft process and there are whispers he may miss part of 2015. On tape, Harris is as quick and explosive as it gets. He can close fast downhill but can also easily turn and run downfield. The main issue, however, is that he is a tiny 183 pounds. Safeties at that size just don’t make it in the NFL. I’ll be interested to see what happens with him in the league. Strong Points: Ball hawk defensive back that has the ability to impact the play several ways. Gets his hands on a lot of balls and knows how to bring it in. Has receiver-type catching ability. Instincts and awareness in all situations are a plus. Can come crashing down like a missile when he diagnoses the running lane. Will go hard after the ball carrier and can deliver a violent pop. Has a short area burst to close a small gap. Showed he can run with speed downfield. Weak Points: Lacks height and arm length and it shows up on tape. Doesn’t react to a crowd well. Struggles to wrap up, ball carries will shake free from him too often. Takes poor angles when exploding downhill. Change of direction when moving at a full speed is below average. Takes chances, which leaves him and the defense prone to giving up big plays. Summary: Fifth year senior. Received a medical redshirt in 2011 after breaking his arm in the third game, missing the rest of the season. Smith had 15 career interceptions, including 13 over the span of his sophomore and junior seasons. A scheme that can move a safety around and put him in to different coverage roles will like Smith. He shows some cornerback-type movement but also has the anticipation skills of a safety. The size limits him a bit, but he plays a physical style and should be able to hide the length issues more often than not. He can be a valuable nickel and dime package player, a role that is becoming more and more important each year. *Productive player here that some people like a lot. He shows ball skills and the ability to cover guys underneath. He moves well and he is pretty savvy, good combination. Has the thick frame but he is short with really short arms. He got overmatched by bigger receivers and crowds in college, not sure he can hack it as a starter in the league. Maybe a scheme-guy or package defender. Strong Points: Versatile defender with the movement ability to play several roles. Quick in to and out of breaks. Easy feet and hips. Great body control and balance. Can play a deep half zone, showing the speed and acceleration to reach the sidelines. Very smart and aware, diagnoses and pounces fast. Aggressive run defender. Will fly in to the box and make sound, wrap up tackles. Weak Points: Undersized. Lacks playing strength and won’t make a physical impact on the game. Not an enforcer. Can be overwhelmed by blockers. Doesn’t get this hands on a lot of balls. Will be out-positioned by bigger receivers in traffic, making it tough for him to make a play. Summary: Has never missed a game over his four year career. Capable of playing safety and cornerback because of his versatile skill set and athletic ability. Smart and heady player that can force his way on to the field. Also a good punt returner. Jarrett lacks the ideal size of a safety and movement of a cornerback, but he is a reliable defender that can do almost anything a defensive coach asks for. *Like Jarrett in the same way I liked Mathieu a couple years ago. He is shorter than ideal but he is a gamer. Jarrett was stuck on a bad team but every time I saw them play, he stood out head and shoulders above despite the shorter frame. Jarrett could be a solid nickel defender and special teams ace/return man. He’ll make a team and he’ll make an impact. *In the box safety more than anything. He is one of the best tacklers in this group with a nice power presence and open field ability. He is a reliable last line of defense and can do enough in coverage to not hurt you. Special teamer with eventual starting potential. *Intriguing tool set and an overly aggressive style will make him a fan favorite for some if he can get on the field. He reminds me a little of Gibril Wilson when he first broke in to the league. He really puts his body on the line but I don’t think there is a lot of upside as a cover man. He is always playing catch up and the body control isn’t there. Could be a nice player on special teams and as a run defender. *Love his game speed. Thompson may be one of the top pure-game speed defensive backs in the class. He has legit range. He shows some raw-ness to his game when it comes to the parts of his game that require more skill, but he has talent that is worth trying to develop. *Physical more than he is fast. Can be a solid run defender and special teamer. Not sure he has the ceiling you look for in day 3 picks but he will be a solid guy that has a job as a backup for awhile. He is smart and showed plenty of versatility at UCLA. *This is a guy that NYG will like, I have a feeling. He is tall and long and showed he can long stride his way in to deep coverage. He has range. I don’t like the lack of physical presence and he isn’t a quick twitch defender. I think the upside is worth gambling on but I just don’t see the football player in him. There is no secret this group of safeties is a weak one overall. As always, however, there are players listed here that will be quality defenders in the NFL. NYG needs to find one of them, plain and simple. 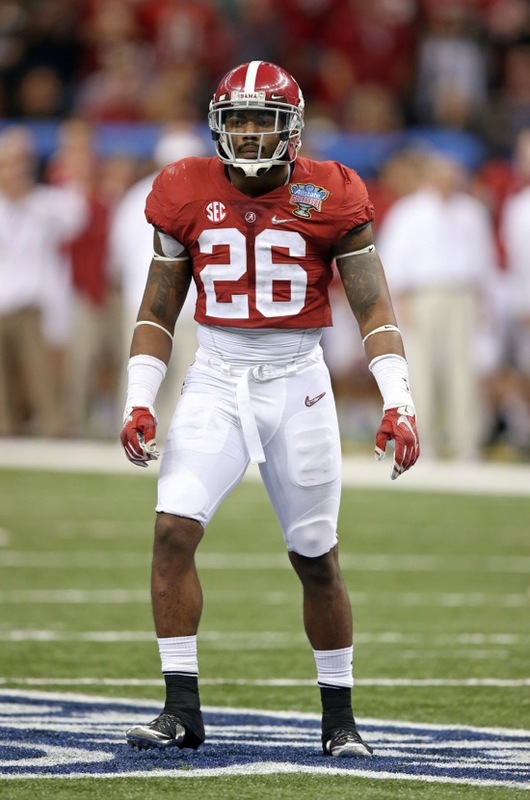 The biggest debate revolves around the grade and status of the top dog Landon Collins. Because he “wasn’t a playmaker”, many believe he should be pegged towards the end of round 1. Collins is a more than solid defender than can do several things at a high level. He isn’t the best athlete out there but that rarely shows up on tape. He plays fast and he plays even more physical. Collins deserves to be taken in the top 15 and it can be argued he is a top 10 player in this draft class. When does NYG go after a safety? If they don’t get Collins or Rowe, I think it’s worth waiting until day 3. Try to find a player that excels as a cover man or excels as a run defender and implement him in to the defense. They may not need to find the superstar, do it all type. If they can find a role player, their safety group is immediately upgraded because what they have now likely won’t cut it. Don’t reach for one when there are better players at other positions available though, again.